Pastel sticks consist of pure powdered pigment combined with an inert binder. The exact composition and characteristics of an individual pastel stick depends on the type of pastel and the type and amount of binder used. It also varies by individual manufacturer. Currently, (September, 2008) I use pastels manufactured by Mount Vision, Girault, Rembrandt, Unison, Terry Ludwig, Schminke, Sennelier, Nupastel, Dianne Townsend, Art Spectrum and Great American. My current favorites are Unison, Ludwig and Mt Vision. Dry pastels have historically used binders such as gum arabic, gum tragacanth. Methyl cellulose was introduced as a binder in the twentieth century. Often a chalk or gypsum component is present. They are available in varying degrees of hardness, the softer varieties being wrapped in paper. * Soft pastels — This is the most widely used form of pastel. The sticks have a higher portion of pigment and less binder, resulting in brighter colors. The drawing can be readily smudged and blended, but it results in a higher proportion of dust. Drawings made with soft pastels require a fixative to prevent smudging. * Hard pastels — These have a higher portion of binder and less pigment, producing a sharp drawing material that is useful for fine details. These can be used with other pastels for drawing outlines and adding accents. However the colors are less brilliant than with, say, soft pastels. * Pastel pencils — These are pencils with a pastel lead. They are useful for adding fine details. In order to create hard and soft pastels, pigments are ground into a paste with water and a gum binder and then rolled or pressed into sticks. The name "pastel" comes from the Italian pastello, meaning "little bread roll". The French word pastel first appeared in 1675. * pastels use only lightfast pigments. Pastels which have used pigments which change color or tone when exposed to light have suffered the same problems as can be seen in some oil paintings using the same pigment. * works are properly mounted and framed under glass in a way which means that the glass does not touch the artwork. This avoids the deterioration which is associated with environmental hazards such as air quality, humidity, mildew problems associated with condensation and smudging. * Fixatives — Some artists protect their finished pieces by spraying them with a fixative. Abrasive supports avoid or minimize the need to apply fixative. A pastel fixative is an aerosol varnish which can be used to help stabilize the small charcoal or pastel particles on a painting or drawing. However, fixative will dull and darken pastel's beautiful colors. It is also toxic, therefore it requires careful use. It cannot prevent smearing entirely without dulling and darkening the beautiful colors of pastels. For this reason, some pastelists avoid its use except in cases where the pastel has been overworked so much that the surface will no longer hold any more pastel. The fixative will restore the "tooth" and more pastel can be applied on top. It is the tooth of the painting surface that holds the pastels, not a fixative. Pastels must be framed under glass to prevent damage. My work very rarely ever uses any fixatives. There are a number of pastel societies around the world. The Pastel Society in the UK was founded in 1898 and founder members and early exhibitors included Brangwyn, Degas, Rodin, Rothenstein, Whistler and G.F. Watts. Current members are typically professional pastel artists. Admission to membership is via jury selection of artwork for the annual exhibition and agreement of existing members. Signature status is designated by the initials PS. By way of contrast the oldest pastel society in the USA is the Pastel Society of America - founded in 1972 by Flora Giffuni to promote pastel art and its development. Membership is by jury selection and signature status is designated by the initials PSA. The International Association of Pastel Societies was founded in 1994 by Urania Christy Tarbet with the aim of promoting pastel art. Its membership is limited to existing pastel societies. During the 18th century the medium became fashionable for portrait painting, used in a mixed technique with gouache. In the USA, initially pastels only had occasional use in portraiture. However in the late nineteenth century, pastel (like watercolor) became more popular. The Society of Painters in Pastel was founded in 1885. Pastels have become popular in modern art due to the medium's broad range of bright colors. 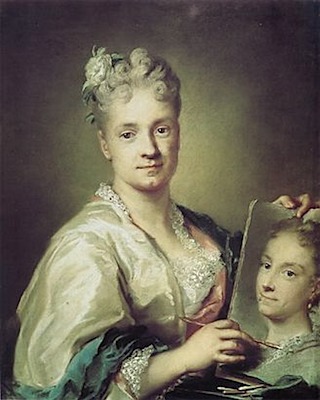 Rosalba Carriera Self-portrait of Italian painter Rosalba Carriera holding a portrait of her sister. 1715. Pastel on paper. Galleria degli Uffizi, Florence. 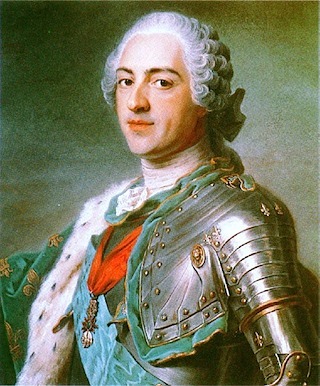 The 18th-century painters Maurice Quentin de La Tour (see above portrait) and Rosalba Carriera are especially well known for their pastel technique. 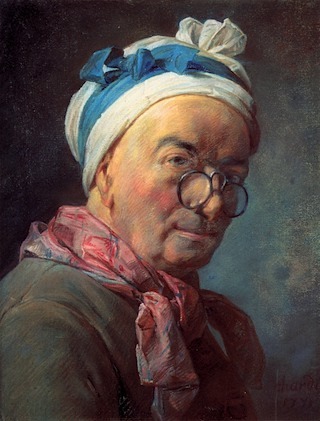 Jean Baptiste Simeon Chardin's 1699-1779 pastel portraiture and still paintings are much admired. 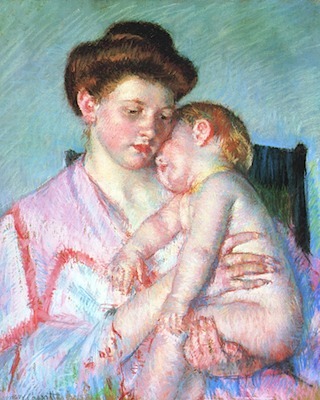 Mary Cassatt, introduced the impressionists and pastel to her friends in Philadelphia and Washington, and thus to the USA. * USA - Wolf Kahn and Daniel Greene. The Pastel Society of America also has a Hall of Fame for outstanding artists who have made a special achievement in pastel.